Chili with all the Good Stuff! There are as many types of chilis as there are…well, chiles. My version of chili has come together from different sources and the amounts given are flexible. This is pretty much the core, or the “bones”, of the chili I’ve been making for years. As I’ve discovered new flavors along the way, they’ve found their way into the soup pot. Some have stayed, some have wandered off to return later and some have run away, screaming, never to return. I add beans; we like beans in our chili, but if you don’t, then leave them out. 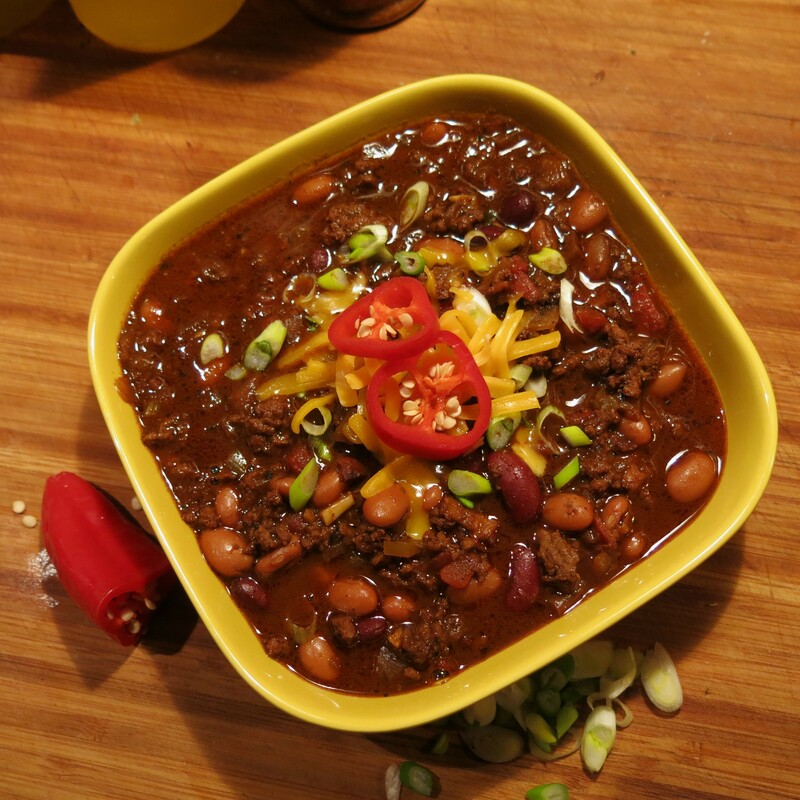 Chili is perfect for large get-togethers like Super Bowl parties…make a chili bar!One of the best things about chili is the make-ahead quality and how much better it is when you reheat it. If you decide to make a chili bar, simply put the chili in a large slow-cooker (when you reheat it) set to HIGH and when it is thoroughly hot, turn the setting to WARM. You’ll need to do this about 2 hours before you plan to serve it. Place the toppings in bowls around the chili and a stack of bowls and spoons on the side and you’re set. Trust The Goddess. This is easy entertaining at it’s best. By the way, this recipe doubles easily. My mother always put celery in chili and I like celery in chili. If you don’t, leave it out. I learned from a chili cook-off champion to add the spices in increments; this way you layer the flavor as the chili cooks. I think that was an important lesson. Buy whole cumin seeds. Toast them in a dry skillet, let them cool and then grind them as you need them. Buy a small coffee grinder (around $15) and make it a dedicated spice grinder. The flavor difference is absolutely noticeable, but you may want to use half the amount given in a recipe, as the flavor of freshly ground spices is much more pronounced. Toasting seeds contributes to the flavor-layering, too. Always purchase whole seeds (or leaves) when possible, then grind them yourself. Remember: The larger the piece, the longer the shelf-life…which applies to many things! And FINALLY, I reserve about 1/3 of the minced fresh garlic to add with the last addition of spices. That’s because The Goddess can never get enough of that garlic punch, but you should do what you want with the garlic, but do add the spices (toasting them first!) in stages. On that note…. In a small bowl, combine the spice blend; set aside. In a large heavy-bottomed 6-quart pot or a Dutch oven over medium-high heat, add the chopped bacon; cook, stirring often, until the fat has rendered and the bacon is crisp, 4 to 6 minutes. Remove the bacon and transfer to a dish. Increase the heat to high; brown the beef, breaking it up using a wooden spoon, 2 to 3 minutes. Remove the meat using a slotted spoon and transfer to the dish with the bacon. You may need to brown the meat in batches. Reduce the heat to medium-high. Add the onions and celery; season with salt and cook, stirring often, until soft, 6 to 8 minutes. Add the garlic, 1/3 of the spice blend (about a rounded teaspoon) and the bay leaf; cook for 2 to 3 minutes, until the pot is very fragrant from the spices. Add the tomato paste, the reserved meat and bacon; cook for an additional 10 minutes. Add 1/2 of the remaining spice blend (about 2 rounded teaspoons), molasses, beer, beans, tomatoes and chocolate. Simmer over low heat for 1 hour and 15 minutes; stir in the remaining spice blend and continue to simmer for 10-15 minutes or until the flavors have melded together. Stir in the vinegar. Taste and adjust the seasoning as necessary. Serve the chili hot, with bowls of avocado, pickled jalapeños, cheddar, cilantro, red onion, lime wedges and sour cream on the side. Use toppings as desired. Make ahead: Chili can be made 2 days ahead, then covered and chilled. Rewarm over low heat. I think it’s much better made ahead. NOTE: I use a combination of 1 tablespoon each of New Mexico chile powder, Hungarian paprika and red bell pepper flakes. I like the subtle, nuanced flavor better and you can always add heat. Also, I used 1/4 cup unsweetened cocoa powder; it works just fine. By the way, this is great used in a Frito pie…. 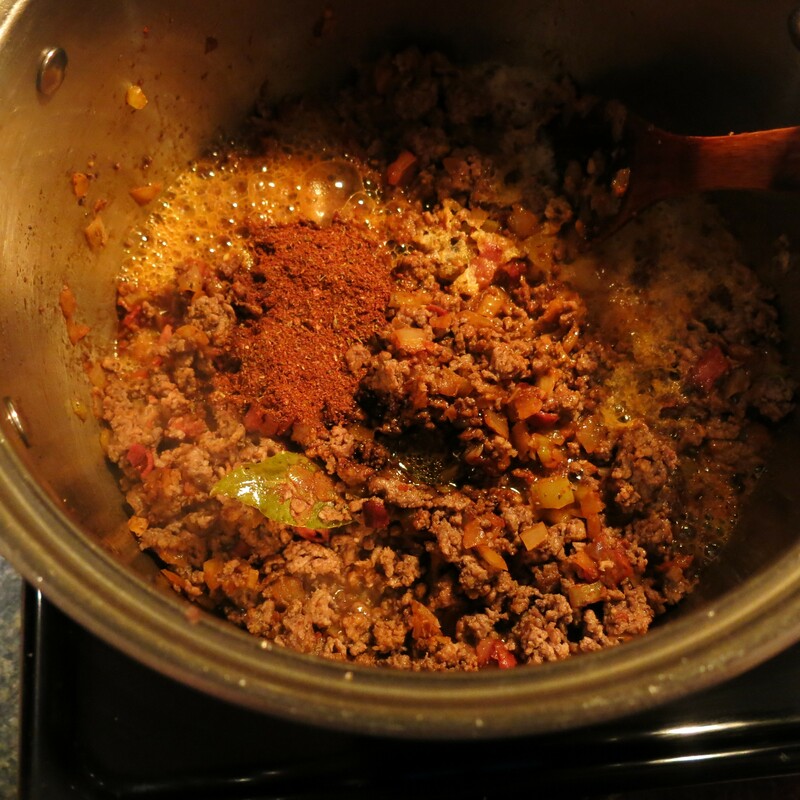 Chili with All the Good Stuff Recipe©Marcia Lahens 2015. All rights reserved. I have 2 words for you…Tomato paste. A recipe never seems to call for an entire can, but usually 1-2 tablespoons. Then, the rest of the can sits in your fridge and becomes moldy. A better idea is to buy the larger can, cut out the bottom and top and drop the paste into a 1-quart plastic, freezer bag. Zip the bag almost closed, lay it flat on your cutting board and very carefully smooth the paste to about 1/4-inch thickness; it will pretty much fill the bag. 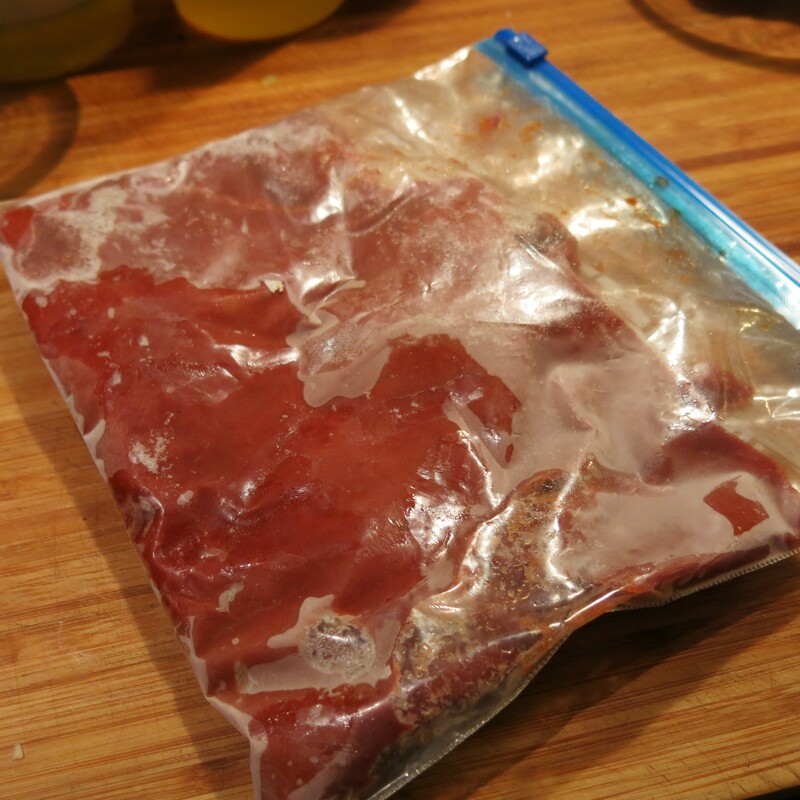 Carefully squeeze out as much air as possible, zip it shut and lay the bag flat in your freezer. When it’s frozen, you simply break off pieces the size that you need when you need them. Seriously, how simple is that? And no more waste…I hate waste. Another thing, I used unsweetened cocoa today, because there’s 10 inches of snow on the ground and it’s about 11°F, that’s about -12°C for the rest of the world…I speak metric (or Celsius)! So I wasn’t going out in the frigid New England weather to get unsweetened chocolate and frankly, cocoa works perfectly. And yet another thing, today I added an extra can of beans, kidney beans to be exact. Feel free to use whatever kind of beans you like or leave them out completely or serve them on the side. By the way, I sometimes serve this with a scoop of cooked rice in the bottom of the bowl. The Latin Lover is rather fond of that version and he always likes some raw onion on top…a little shredded sharp cheddar, too. And still yet another thing (I’m not certain I can even say that), I like to add beer, but add some beef broth or water, if you prefer. I usually add a couple of cans of water and 1 tablespoon of beef soup base when the chili does it’s initial, longer cooking. I like the savory-ness it adds, as well as the extra liquid, and please don’t leave out that cider vinegar…flavor is a balancing act. By the way, at the risk of sounding like a snob, I want to clarify something…when you’re talking about the soup…it’s c-h-i-l-i; when you’re talking about the pepper…it’s c-h-i-l-e and when you’re talking about the weather…it’s c-h-i-l-l-y. So, you put chiles in your chili, which tastes so good when it’s chilly! Just wanted to clear that up! We’ll have this tomorrow, but this is perfect for Super Bowl Sunday and as I mentioned, it reheats and will stay hot in a slow-cooker incredibly well. Okay, enough said, now eat! Great! 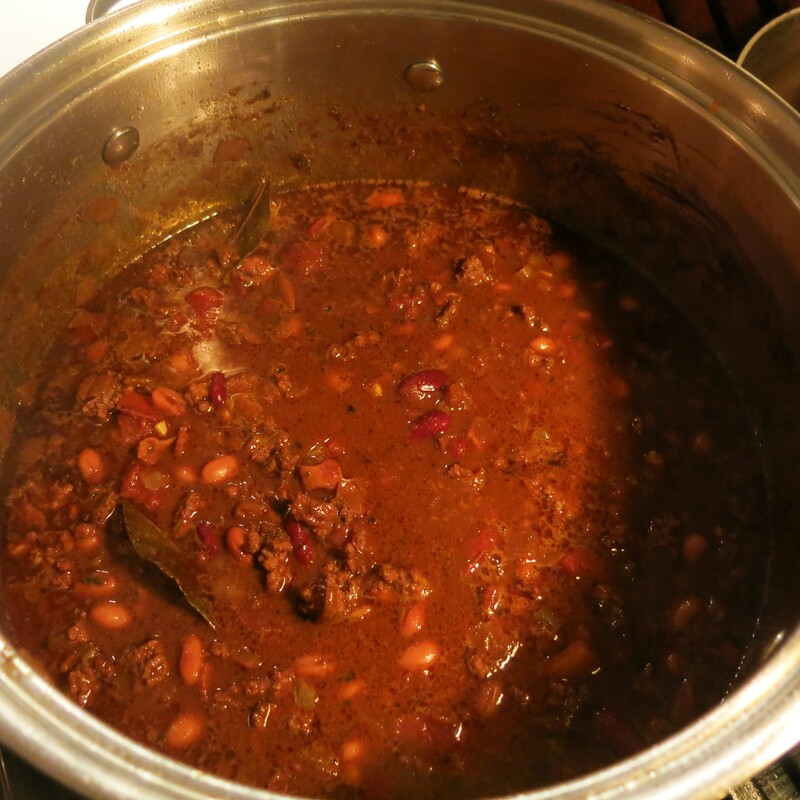 Chili is so good at this time of year…it keeps the cold at the door. I’m really flattered that you’re enjoying the blog. If there are any recipes or questions about cooking in general, don’t hesitate to ask. Thanks again, and keep cooking! I like the celery idea. On that note to “green” it up try stirring in some leeks or scallions just prior to serving. We like the “crunch” from scallions or finely chopped onions add for service. Chili for chilly days!